Spring is here, and that means it’s time for yet another delicious recipe from the secret collection of recipes from the Clog (don’t ask about the logic). Today, take a break from the constant stress of midterms and travel to food heaven, where your taste buds will be delighted by the complexity of the harmonious combination of savory spring onion and incredibly fluffy steamed bun. So, without further ado, we present a delicious recipe that would be perfect for breakfast, lunch, dinner or a late-night snack. Mix together all-purpose flour, white sugar and salt. Put yeast in the warm water to activate the yeast, so that your buns will rise up nice and fluffy later on! After the yeast is activated (after around 5 minutes), mix the warm water-yeast mixture with the dry ingredients. Knead the mixture into a combined dough (knead for around ten minutes — this is a great opportunity for you to take out all your frustrations for a great cause), so that the ingredients are well distributed throughout the dough mass. Cover the kneaded dough ball with a cloth and place in a warm area. Wait for the dough ball to almost double in size (this will take around two hours). After the dough has doubled in size, push out all the air, and roll out the dough into a 40-centimeter by 20-centimeter rectangle. Rub the oil across the entire dough surface and sprinkle some salt and green onions evenly over the entire dough surface. Roll up the dough lengthwise, then cut up the rolled up dough log into 24 pieces. 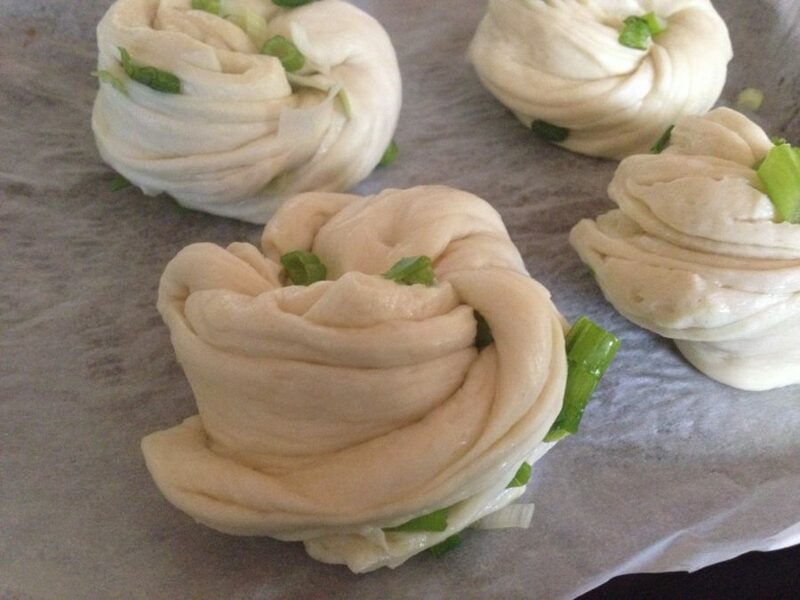 Assemble flower buns by placing two pieces of the dough log on top of each other, then twisting the dough pieces around into a knot. Place assembled buns onto parchment paper, then let the buns rise for about 30 more minutes. Steam the buns in a steamer for around 15 minutes and then the buns will be ready to eat! They should be warm, incredibly soft, fluffy buns with the savory fragrance of green onions — a great reward after all those terrible midterms!